We do not think enough about what we do or the context of our encounters and interactions with youth. Indeed, I worry that too much of the literature of our field is prescriptive – telling us what to do but not inviting us to reflect on why we do what we do or the larger context which impacts on our work with young people. This is worrisome because it invites people to act without critical reflection. Maurice Fenton’s book, fortunately, provides somewhat of a counterpoint to this sad reality. While I do make reference to various chapters or sections in this review, I focus mostly on my response to the book, which seems appropriate given the style of the writing which is filled with personal reflection and interpretation. It is relaxed, yet informative. I must confess the sheer size of the book was intimidating, and a quick scan of the interior told me it was going to be a long read. Well, it was a long read – and that turned out to be a good thing. It took a long time because there is so much to reflect upon. Time after time, I found myself stopping to think about what he was saying: sometimes because I came across something I had not thought about before, sometimes because I disagreed with what was being said and sometimes just to wander off into my own thoughts and memories prompted by something in the book. It promoted much reflection and discussion with colleagues as I worked my way through it. It is a unique book because of the style of writing. 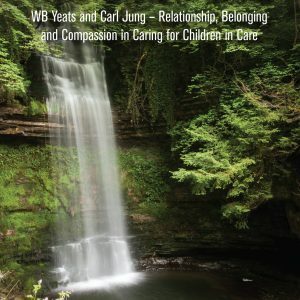 Fenton uses his relationship and encounters with young people as a foundation for his reflections on care, care-giving and effective helping. Using these stories of encounter provides a human foundation which serves to avoid the common tendency to objectify, or over-intellectualise, the human experience of young people in care services. Using personal experiences and stories grounds theory in the everyday experiences of young people and workers. The story-lines, especially of his connections and relationship with a young lad named Keith, serve to weave the different sections of the book around a common thread of experience – it is an interesting literary conceit in a teaching text. This is a courageous undertaking: describing one’s supposedly therapeutic encounters exposes one to criticism and evaluation on a personal practice level. At times I would find myself agreeing with how Fenton says he acted in an encounter with a young person and at other times I found myself criticizing his approach. This opened up the opportunity for self-reflection, wondering why, for example, I disagreed and might have done something differently. This makes the book valuable as an opportunity for self-reflection by the reader, an event not frequently experienced in reading what is, essentially, an academic text. In Chapter 6, Social Pedagogy, Relationship-Based Practice and Mentoring, Fenton outlines the great value he finds in Social Pedagogy and relationship-based practice. However, I find his exploration of relationship-based practice short and limited in scope, relying as it does on few references, and missing the contemporary discussions about relational versus relationship-based practice. This is a shame, really, as the foundation of this book is the relationship between Fenton and others and so one might expect a greater elaboration of the tenets and expectations of a relationship-based approach. Personally, as one most interested in direct care practice, I think the book could have ended here. By this point Fenton has made clear what he believes about effective helping and has offered much food for thought. But reading on was worthwhile. While the section on Children’s Rights and Policy will be of greatest interest to practitioners and thinkers in the UK and Ireland, it provides a wonderful study of the impact of Rights and Policy contexts on local practices. As such it offers a set of ideas for considering their impact on direct care practice and services in any locale. In this section, Fenton is not afraid to make his views, controversial and critical as they might be, explicit. In the section Rethinking Residential Care, Leaving Care and Aftercare, Fenton really comes into his own with overt criticisms of the current Social Care system. In the opening he makes it clear that he recognizes his own biases – as he says in the introduction to this section: ‘[d]espite our goal of seeking a balanced and nuanced position, we all have our own biases’ (p.246). His thought show through the use of phrases such as ‘bureaucratic models invest power in external managers who may have limited, outdated or indeed no experience in caring for children with complex needs’ (p.249), or ‘key performance indicators (KPIs)… are aligned more with the requirements of management than the well-being of children’ (p.250-251), or ‘the pernicious tentacles of free market-defined corporatism’ (p.251) when criticizing the system of care. Fenton will undoubtedly be taken to task by many for daring to be so critical. But there is a reason for his criticism – it is not gratuitous – it is to provoke the reader to think about the elements of context which surround the care interaction. And in this Fenton is successful. We must be wary of becoming overly politically correct in what we say or advocate for fear of censure, loss of standing, or access to funding streams, or worse perhaps, perceived incompetence. It is within this context that my views will not be accepted by all and that my methods may well be subject to criticism (p.269). In his conclusion, Fenton says that he believes the ‘surest way to promote better practice and keep young people safe’ (p.325) is to ‘[b]e curious and question everything’ (p.325) And question everything he does! This book is worth the read. It is provocative, critical and stimulates much reflection. If you buy this book, and I think you should if you are seriously interested in the context of the human Social Care interaction, be prepared to give it the time it deserves.